Time to introduce you to another sponsor and fun giveaway. Maryanne, from Scrappy Gifts, has made your life so much easier. She creates adorable scrappy gifts all while using your pictures and information to create wonderful displays of your memories for you and your family. We all know scrapbooking is so fun……but takes a lot of time. So, if you just can’t quite squeeze in the time to scrapbook your little heart out, let Maryanne do it for you. Okay, love that idea. 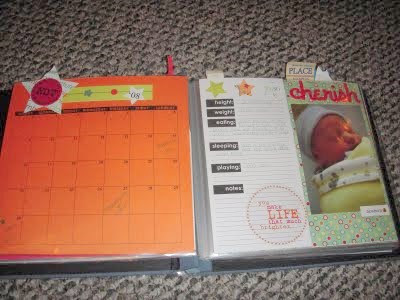 You can purchase already made calendar scrapbooks and write down things that happen certain days of the month. This is especially nice for your baby’s first year. Look here for more details. Maryanne also has sweet little scrappy clocks found here. She also takes great care creating wedding scrapbooks here…. And the wedding guest books are found here….. Such a darling alternative to the plain ‘ol sign in book. So much to see and Maryanne’s ideas seem to never end. So perfect. Maryanne is offering 15% off 1 item through October 1st. Make sure to mention that you came from Make It and Love It. So hurry and decide which little treasure you’d like. Also, Maryanne has decided to do a giveaway here on Make It and Love It. She will be offering two different items to 2 different winners. Excellent. First, a customized scrappy box for one of you. This is such a fun way to contain your scrapbooking in a box. This would be great for baby’s first birthday, a family vacation, etc. So cute. Second, a customized scrappy canvas for another one of you. Great decoration idea for the wall of any room……and a great gift option. Just add a picture to a sturdy little canvas. I will be selecting 2 separate winners. Yay. **Please note:You must enter in a separate comment for each entry. (Example: If you’d like 5 extra entries for visiting a shop, you must enter 5 different comments, in addition to any other entries/comments.) Thanks. Go on over to www.myscrappygifts.blogspot.com and look around for a while and choose your favorite item. Tell me your choice in your comment. Become a fan of Scrappy Gifts on Facebook. Let me know that you did in another comment. 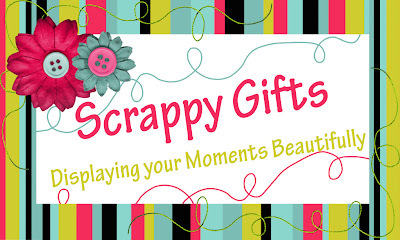 Add the Scrappy Gifts button that can be found on Maryanne’s right sidebar here. And then tell me you did in another comment. And thanks again Maryanne. Your ideas and creations are just perfect for any of us who love and appreciate scrapbooking…but just don’t have the time or your same ability. So sweet. You can find Maryanne and Scrappy Gifts anytime on my left sidebar. Wow…. those are amazing. I especially love the box. How creative. Those scrappy boxes are soooooo cute! Oh and on her site, totally love the first year of marriage scrap book! Oh so cute! love those ideas! I love those scrappy boxes. Wehn I went and looked at her site, i didn't realize exactly what they were! but they are so dang cute! pick me! Just too cool! Love the boxes! I love the baby scrap book. ooooooh This looks fun. I wish I had more time to scrapbook. It'd be great to have someone do it for me. I love the idea of a giveaway too! I love the clock! so cute! Also love the wedding sign ins! What brilliant ideas she has, and so well executed. Would love to win either of those great goodies! Thanks for the chance. I'm already a follower, love your site! The Scrappy Boxes are my favorite thing on her site. So compact, but with such impact. The box is super cool! I would love that. I love the baby scrappy boxes! I have a lot of friends who are pregnant right now and these would make awesome gifts! I added the scrappy gifts button! I follow your blog as well :) Forgot to add it earlier! I would definitely choose a baby calendar!! I've got to do some serious catching up with my scrapbooking! Kristen Kemmet: kriskem@gmail.com. I am a fan of scrappy gifts on facebook :)and I also follow your blog. My fave product is the scrappy box! they're so fun to make.